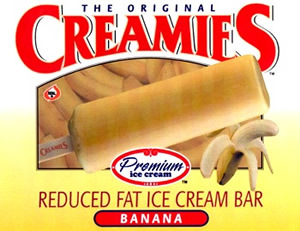 The very best summers when I was a kid included banana Creamies on the farm. I did a lot of growing up on my Uncle John's dairy farm in Cache Valley, Utah. It was a good place to be a kid—feeding chickens and calves, cows and dogs, jumping from the haystacks, riding shotgun on the tractor. Summer nights, the cool crept over the fields from the Bear River, smell of the slough, cut hay and silage. I lived to hang out with my cousins, all older than me, maybe even in high school. They were smart and funny and beautiful, and I wanted to grow up and be just like them. Evenings were never too late—milking chores started earlier than the sun—but farm nights seemed darker than other places, the sky a deep, black bowl with stars. One time John Terry and Bart had firecrackers. It could have been the 4th of July. The girls pushed each other in the swings or lounged on the grass. Rockets zipped from the milk cans set on the driveway, and when those ran out, the boys filled the cans with Black Cats that rattled our eyeballs and sent the feral kittens streaking from our laps to the barn. I'd give anything to spend one more morning in my aunt's kitchen helping her make bread. She could turn out half a dozen loaves quick as a stitch. She'd always burn the last loaf for my Uncle John and butter the blackened top just the way he liked it. The nostalgic inkling to return "home" to the farm has conflicted me since before I had words, and a certain pang of loss accompanies the musing of what could have been a different life lived out there, although I've made enough peace with the past that regret doesn't dig into me these days. Not too much. I do wish for that morning with my aunt. Her hands over mine, guiding me through the kneading. Press, fold, turn. Press, fold, turn. "Yup. Just like that." Once more to hear my uncle call out from the tractor, "There's our Sher-bear." The regret that remains is that I didn't realize sooner how it was all so precious.